WASHINGTON (COA) -- The fighting in Iraq and Syria is impacting not only refugees, but people in the United States who are deeply connected with the region. 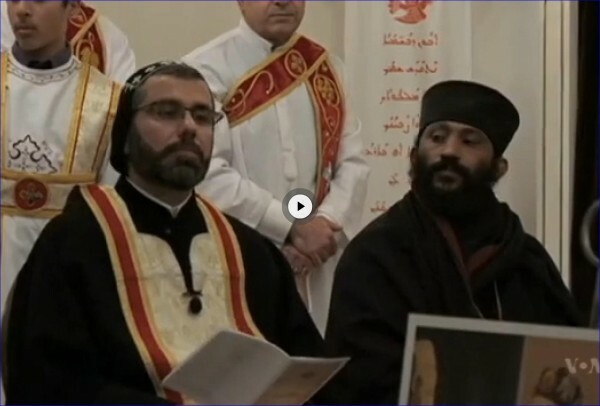 Christians who come from those countries gathered recently at the St. Aphraim Syriac Orthodox Church in suburban Washington to pray for peace in the Middle East. The church recently hosted its first ecumenical prayer service, which was attended by Syrian, Antiochian, Ethiopian, Armenian Orthodox Christians, and members of the Lebanese Maronite Church. They remembered the victims of the conflicts in Syria and Iraq and expressed hope the unrest would end and that hundreds of thousands Christians would be able to return home. Portraits of Greek Orthodox Bishop Paul Yazigi and Syrian Orthodox Bishop John Ibrahim are on display on the altar during the service. These two bishops were kidnapped while they were traveling outside the northern city of Aleppo in Syria doing humanitarian work. They are still missing. Father Fady Abdulahad of the Syriac Orthodox Church says the fate of these bishops is a reminder that the Middle East remains one of the most dangerous regions for Christians. “If we are speaking about big cities like Damascus and Aleppo, there is still hope for people to live there because it is a big city and because the insurgents and terrorists have not made their way to the city. 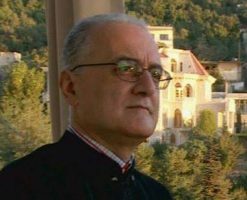 The story is different at other places of Syria – in rural places, villages, where the Christians live – they are surrounded by terrorists,” he said. 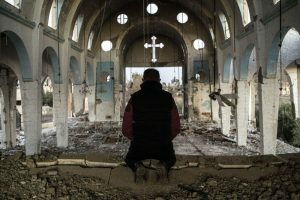 The organization Open Doors reports violence against Christians by the “Islamic State” and other Islamic terrorist organizations have forced more than 70 percent of Iraqi Christians and more than 40 percent of Syrian Christians to flee their countries. “It was a beautiful life. 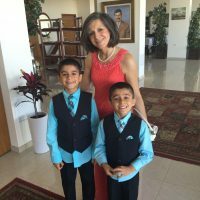 We had everything,” remembered Sabine Hannoush, an asylum seeker from Syria. Christians here called for the West to pay closer attention to these minorities persecuted in the Middle East. Though the United States has provided $3 billion in support for Syrian refugees who are now in Jordan, Lebanon, Turkey as well other neighboring countries, it has taken in only 300. The State Department says this situation may change in the near future. Many Christians worry that if they leave – they won’t be able to go back. But as the conflicts continue, so does the exodus of those being forced to flee their homes.